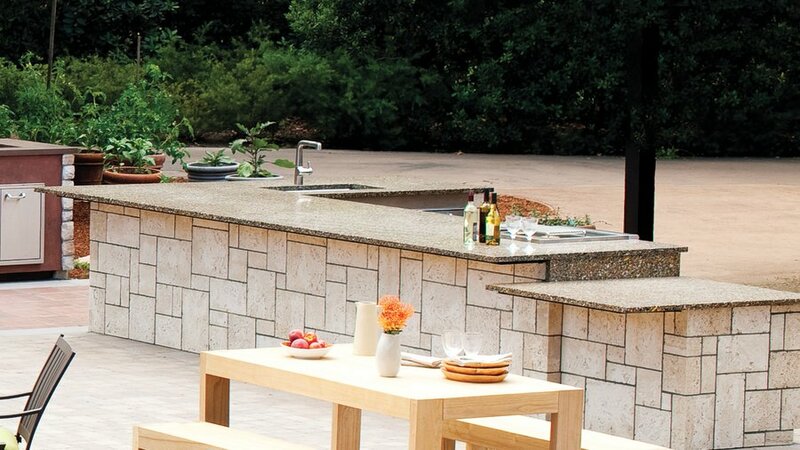 Whether your backyard plans this summer revolve around a hibachi and a pair of folding chairs, or a fully equipped cooking and dining area, you’re bound to be entertaining outdoors. 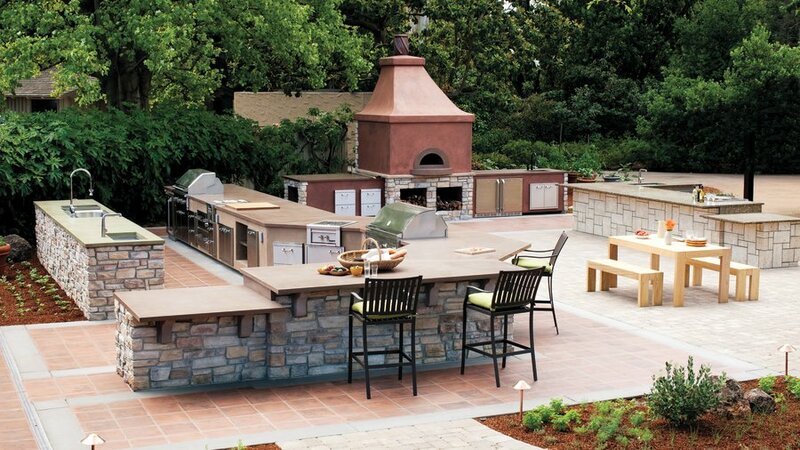 With that in mind, we unveiled a new outdoor test kitchen here at Sunset’s campus in Menlo Park, California, just in time for the warm weather. As conceived by Palo Alto designer Robert Waterman of Waterman & Sun, and using products donated by our sponsors, the kitchen will let our food editors explore fresh cooking techniques and develop recipes to share with you ― we’ll even be able to tape videos in it. 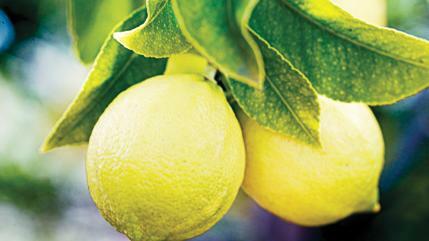 Click through this gallery to see some of our favorite things about the kitchen. We hope you’ll be inspired too. Durability and function drove the design. 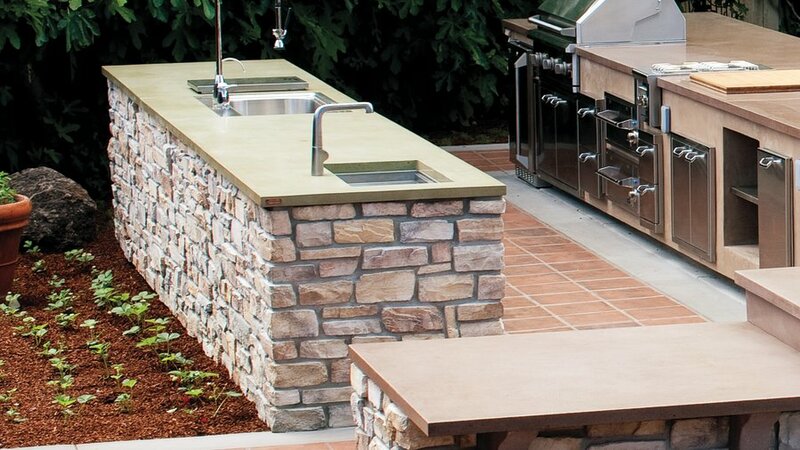 Stain- and acid-proof sealed concrete tops the two islands in the main prep and grilling zone. Deep stainless sinks by Kohler ease cleanup of large pots and serving dishes. 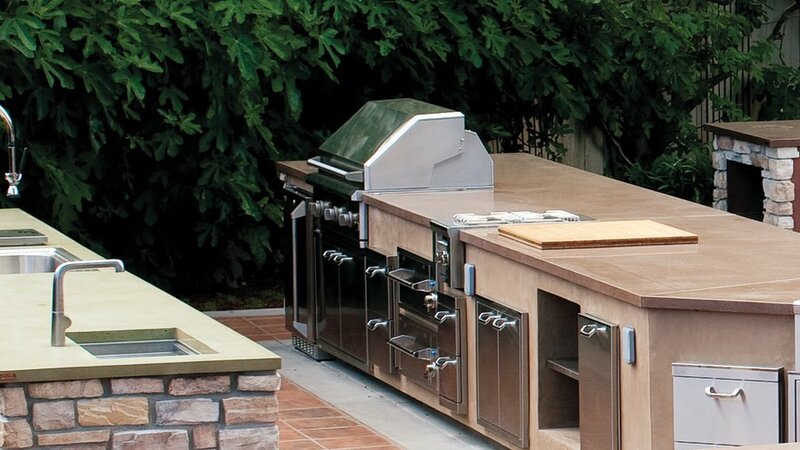 Two 42-inch grills (this one is by GE Monogram) ensure efficiency in our multichef kitchen. While one cook rotisseries a Thanksgiving turkey at one station, another can sear flavor into an everyday entrée at the other. The versatility of the Mugnaini Prima 120 won our hearts (it’s the same kind used at Chez Panisse). Food editor Margo True says, “"You can flash-bake a pizza at 750 one day and slow-roast a leg of lamb overnight the next." Saltillo tiles (rare extras from our circa 1970s test-kitchen floor) connect indoors and out. 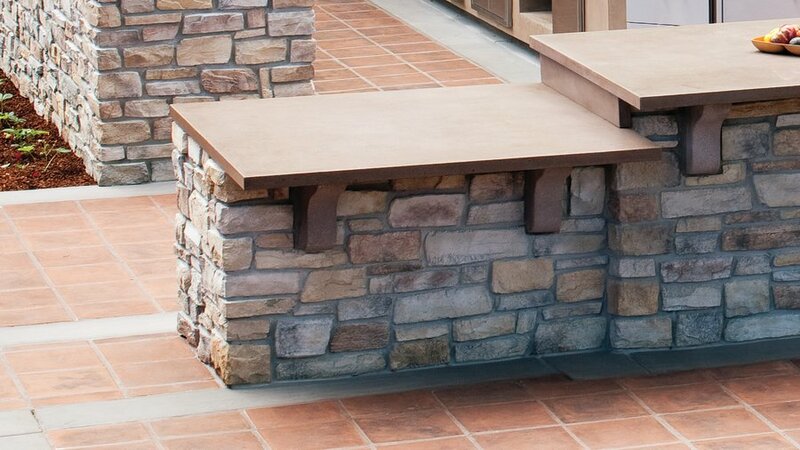 Their terra-cotta color complements the Eldorado Stone veneer on the islands and Belgard pavers elsewhere on the patio. 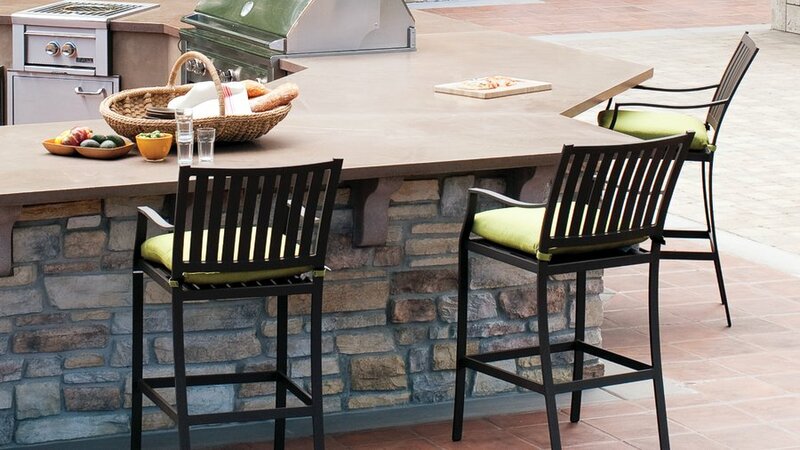 Fade- and spill-proof, Sunbrella fabric cushions help minimize upkeep in our outdoor entertaining center. We chose this pretty green to echo the moss-colored prep counter and the surrounding foliage. 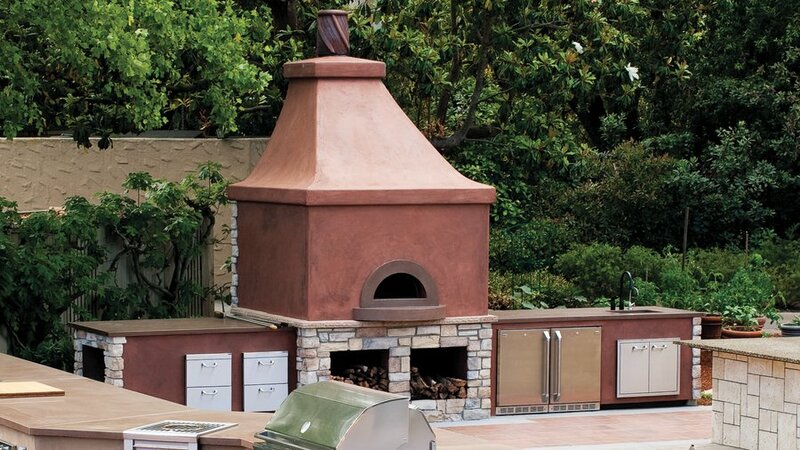 We’'ve honored wine's importance to the West with a 20-foot-long island that includes chillers, glass storage, a sink, and a two-burner grill. "I love serving hot nibbles with our tastings," says wine editor Sara Schneider. 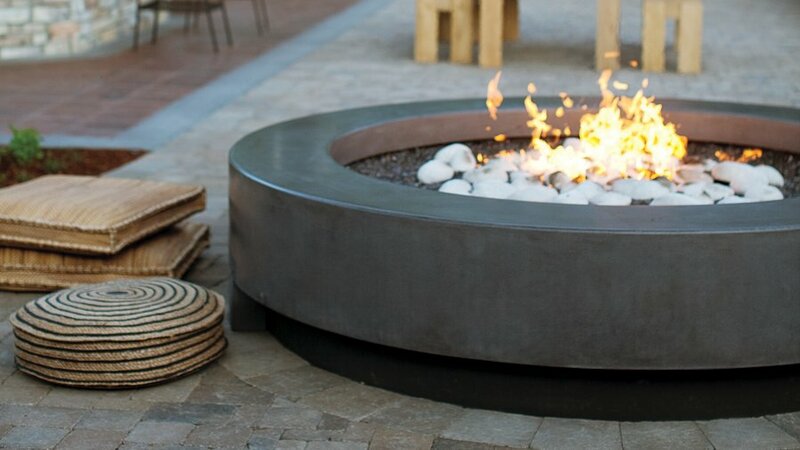 Lined with crushed glass and warmed by a gas flame, the concrete firepit encourages year-round gatherings. "It will be a fun, cozy place to try new s'mores recipes," says test kitchen coordinator Stephanie Dean. 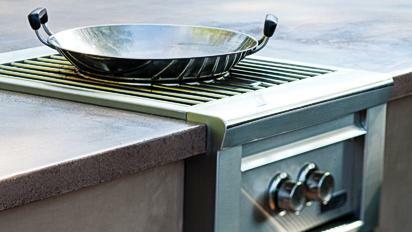 With 46,000-BTU [British Thermal Unit] output, the side burner offers about four times the heat of a typical stovetop unit and can be configured for wok cooking. "We can make great stir-fry dishes," says True. 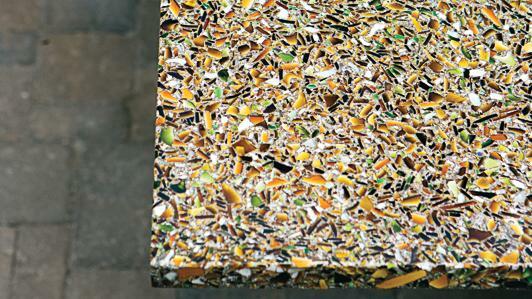 On the wine bar, Vetrazzo’s Alehouse Amber patinated slab, made of 85 percent recycled glass (including wine bottles), wipes up with soap and water.